Katherine Johnson Technology Magnet exterior view. DESOTO—The new Katherine Johnson Technology Magnet will open its doors to almost 900 students, kindergarten through fifth grade, Wednesday. Celebrating this addition, the district will host a ribbon-cutting event at 10am at the campus located at 1200 Academy Way. The event will feature student performances, an overview of its academic offerings, an introduction of the principal and tours of the new campus. 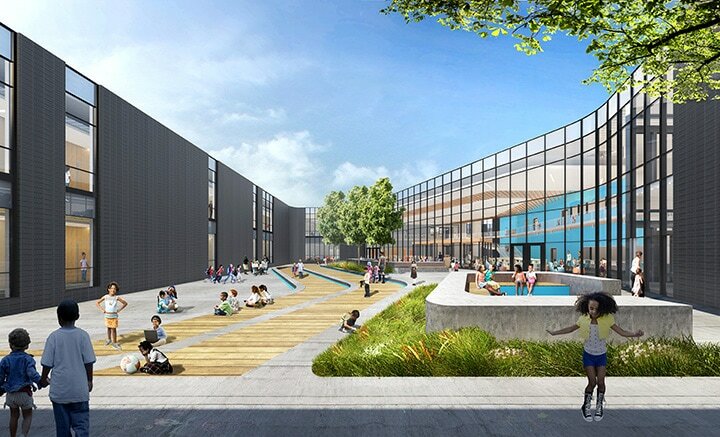 The 109,500-square-foot, two-story building, designed by the Dallas office of global architecture and design firm Perkins+Will, will provide future-oriented academic learning opportunities focused on robotics, coding, computer science, digital art and music. The variety of outdoor learning areas encourage student engagement and teamwork and provide daylight and easy access to outdoor activities. Both levels include rows of classrooms that line the exterior edge of the building footprint, surrounding the media center. Two-story spaces and corridors provide an abundance of natural light and provide maximum transparency to inspire student curiosity. All student areas provide direct access to the media center, visual access to outdoor learning areas, close proximity to adjacent grade-level classrooms, dedicated grade-level storage and access to operable, acoustic glass partitions at the lower-level spaces providing flexibility and privacy to users. After a community-wide vote, the Katherine Johnson Technology Magnet Academy was named in celebration of Katherine Johnson, one of the first African-American mathematicians employed by the National Advisory Committee for Aeronautics, which later became the National Aeronautics and Space Administration (NASA) in the 1950s. To honor her legacy and impact, the design team created an interactive graphic showcasing Katherine Johnson’s life, her work and applicable math and science features that will be displayed throughout the building. The Katherine Johnson Technology Magnet Academy was developed with a progressive design concept that reimagines educational facilities to better support the innovative learning and instructional practices necessary for 21st century, future-focused education. With an emphasis on technology, STEM and outdoor learning, the school will provide extensive opportunities for students to engage in project-based, collaborative learning in a state-of-the-art building that’s environmentally friendly and energy conservative. The facility’s design is accented by four, secure outdoor learning environments accessible by students. Katherine Johnson Technology Magnet outdoor learning area. Upon entry, a set of stacked computer labs showcase the school’s academic, technology-centric focus. On the upper level, high-tech robotics and science labs share an outdoor learning lab to allow students to create and work on projects together. To further cultivate a culture of innovation, the exterior design of the robotics and science classrooms mimic the personality of the robotics and coding programs by applying a binary code pattern to the windows in conjunction with colored metal panels. To foster creativity through digital media, art and music, the Katherine Johnson Technology Magnet Academy features a centralized, two-story media center at the heart of the school. Other music and art spaces include digital production labs, a voiceover studio and an AV broadcast room to support and expand curriculum offered. Even more, the art lab has exterior access to a private outdoor art and sculpture area through a set of operable garage doors. Spread across both levels of the school, each grade level has its own dedicated collaboration space equipped with the needed technology and furniture for flexible learning. “By creating a venue for first-hand experience with technology and digital media, we provide students the unique opportunity to learn the skills needed for today’s workforce at an early age,” said Nayak.